The Austin Air HealthMate Plus is the top-sold air purifier of this brand. It is a simple mind trick, putting it aside the popular Austin Air HealthMate with a huge upgrade for a small extra, and how can you resist buying this definitely great air purifier? If you still consider, you need to read our Austin Air HealthMate Plus Review right now. Do you know that the Austin Air is the only air purifier brand selected by the U.S government in lots of campaign to deal with the chemical weapons, gas leak and natural wildfire smoke events? This is also the top 1 air purifier brand in the United States since 1990. And the Austin Air HealthMate Plus is by far, the most popular air purifier that if you pay this much for an air purifier, you will be happy for sure. Now, please read our Austin Air HealthMate Plus Review. Austin Air has positioned their place among the very high-range air purifiers, with the start of the original Austin Air HealthMate. And with the show of the Austin Air HealthMate Plus, this brand is ready to go toe-to-toe with any big air purifier brands in the world, like the Blueair, IQAir or Coway. It doesn’t come cheap, but as years have gone its price has dropped, and thanks to the latest flagship named Austin Air Bedroom Machine. But even with this more powerful brother following it, the Austin Air HealthMate Plus remains one of our favorite air purifiers of the year – and that’s after a serious amount of time spent using it. This is also the air purifier featuring in our list of best air purifier for allergies. You shouldn’t look for any change from the outside appearance, as all air purifiers from the Austin Air family come with an unique housing. It is great to just pick one device, and you can plan to upgrade to the better ones right with the current machine. The Austin Air HealthMate Plus price is about $715. But you can always check for a better price with our deal below, no doubt due in part to the launch of the Austin Air Bedroom Machine. Also, you should note that this is a $120 upgrade for the previous Austin Air HealthMate. However, that still means it’s well worth shopping around to see what kind of deal you can get on the Austin Air HealthMate Plus. But for the price, this air purifier is the direct rival of the Airpura R600 and Airpura V600. Put aside the Canadian copied machines, this is still the tough competitors against all other strong competitors like the Alen BreatheSmart 75i, Blueair Classic 605 or AIRMEGA 400S. No matter which air purifier you are going to buy, they are all the very good option to consider for a high-range air purification. Okay, back to the deal of the Austin Air HealthMate Plus. You can grab it right now. Austin Air HealthMate Plus Air Purifier B450B1 Black. The Austin Air Healthmate Plus HM450. The top dog of the famous Austin Air family. 5-year-warranty for both the housing and the air filter. The Austin Air HealthMate Plus is, in general, another air purifier which resembles exactly like the original Austin Air HealthMate. Yes, there is no way you can differentiate one from another in the Standard Series of Austin Air family. It is the capable opponent for the Airpura V600, and you should notice the similarity in both these North American air purifier brands. From the whole, you’d be forgiven for thinking that exactly the older HealthMate machine. It is, exactly, the steel housing, baked on powder coat paint finish. The hardware might be slightly newer, but with both devices are manufactured in the same number, it is safe to think of the Austin Air HealthMate Plus to be really, really durable. This will be a bit of an audience-divider. If you don’t care much about the appearance of the air purifier, you will like the concept of Austin Air. Even with an older HealthMate, you can just upgrade the inside air filters to be the ultimate Austin Air HealthMate Plus. It is much convenient, and you don’t need to read the manual again and again. With 23 inches in height, you can easily reach the top knob to change the fan speed of this air purifier, whenever you sit and work in your desk. The Austin Air HealthMate Plus also features the 360° air intake system, with the key feature of the perforated grill that improves the performance. Just like any other machines of this company, the Austin Air HealthMate Plus is CSA (Canadian Standards Association) approved – the highest certification for any electrical, mechanical, plumbing, and gas products that meet the strict requirement to be safety. 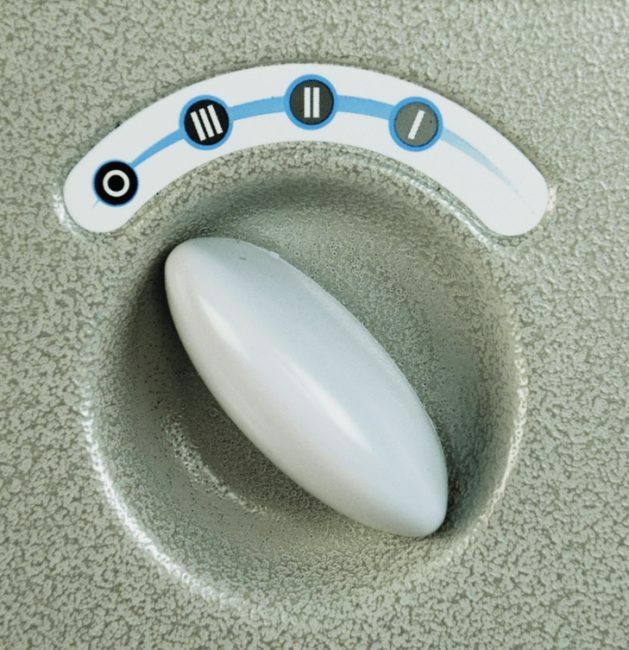 Beside the top outlet air grill of this Austin Air HealthMate Plus, there is one knob to change fan speed. Again, we have 4 main color options for the Austin Air HealthMate Plus: Black, Midnight Blue, White and Sandstone. I hope that you won’t mistake this air purifier with the cheaper HealthMate in the local stores. Instead, you can always trust Breathe Quality’s deal to have the right air purifier. The Austin Air HealthMate Plus is 47 lbs, such weight that without the 4 casters, some of us can’t even lift it to move elsewhere. There are too many factors to review an air purifier device, but the air filtration system is indisputably the most important. Normally, we will check the quantity of air filters and what air filter types it used first. Austin Air HealthMate Plus features a signature 4-stage air cleaning system from this brand. Pre-filter – During the first stage, Austin Air HealthMate Plus will capture any large objects of airborne pollutants which can be seen by the naked eye, such as large dust, pet hair, fur and even some pet dander particles. Medium Particle Pre-filter – Just like Rabbit Air MinusA2, Austin Air HealthMate Plus makes use of a double pre-filtration, and can remove small to medium size particles like dust, pollen and mold spores in this stage. Activated Carbon filter – A 15 lbs of Activated Carbon, potassium iodide and zeolite mixture to help remove household smoke, odors and even chemicals like formaldehyde, benzenes and Volatile Organic Compounds (VOCs). True HEPA filter – The signature 60-sq-ft Medical-grade True HEPA filter of Austin Air HealthMate Plus can remove 99.97% of all particles larger than 0.3 microns, and even 95% of all particles larger than 0.1 microns. There is no reason for the Austin Air HealthMate Plus to not continue the wonderful air filtration system that set forth in the previous Austin Air HealthMate. An amazing double pre-filtration is the start for an overall powerful system, which is even able to deal with the fine particles. As you can see, only the tiniest particles are able to pass these filters, just to be captured permanently in the True HEPA filter. Thanks to the combination, the True HEPA filter of Austin Air HealthMate Plus can last for 5 years – the longest time recorded for a HEPA air filter without replacement. The precious upgrade to this Austin Air HealthMate Plus is the brand new Activated Carbon filter, with the add-on of potassium iodide to enhance the binding of chemicals faster. And don’t forget that is still the 15-lb carbon filter, with more charcoal than even an IQAir GC MultiGas or Oransi Erik 650A, so the Austin Air HealthMate Plus is the ultimate protection against any types of chemicals like formaldehyde, benzenes and Volatile Organic Compounds (VOCs). With a combination of natural zeolite, this air filter can deal with more than 3000 types of toxic gases and odors. With a 60-sq-ft Medical-grade True HEPA filter, it is still the best air filter with the most filter media. It helps the Austin Air HealthMate Plus capture the tiny particles much easier, and in real-world use, it can trap even the pollutants down to 0.1 microns. So far, I have completed a lot of tests for the Austin Air HealthMate Plus. One of the most notable tests is putting it head on the more expensive air purifiers like Airpura UV600, Airpura P600 and IQAir HealthPro Plus. As you can see, they all run in the same conditions. From this luxury test, I’ve found out the performance of the Austin Air HealthMate Plus is nearly the same with other ≥ $800 air purifiers. That’s a great compliment for an only $700 machine. There is always downside for an upgraded version, and for most of the time, it is the higher cost. To replace the filter for Austin Air HealthMate Plus, you need to pay for $359. But again, I need to remind you that the True HEPA filter can last for 5 years, so you only pay for $72 per year for the filter replacement. In such high-range segment, this cost is really affordable. Another selling point of the Austin Air family is the fan power, which mostly translated in the room coverage. Austin Air HealthMate Plus is able to cover an extra large space, up to 1500 sq ft. The ACH of Austin Air HealthMate Plus is 2X to 4X. With such high air changes per hour, the Austin Air HealthMate Plus can exchange the air in your room every 15 minutes. The CADR of Austin Air HealthMate Plus is 400 cfm in general. This is a very high CADR rating, and in real-world use, the Austin Air HealthMate Plus can clean your room pretty fast. It seems this company doesn’t even try to improve the negative side of the powerful fan. As far as I know, the Austin Air HealthMate Plus still uses a Permanent-Split Capacitor motor which is mounted on shock absorbers just like the previous HealthMate Standard. Then, you need to accept the already noisy fan operation of this machine. So to say, the noise level at the lowest setting is 50 db. It is even higher than the highest noise level of some lower-range air purifiers. And once you switch to the highest speed, the Austin Air HealthMate Plus nearly reaches the threshold of “noise”, with 66 db. If you mostly run the air purifier on highest speed, make sure that you won’t be affected by noisy sound. The Austin Air HealthMate Plus has a Permanent-Split Capacitor (PSC) motor to draw less current and reduce your operating costs. However, you still experience a quite high power consumption from 56W to 132W. For running an Austin Air HealthMate Plus 8 hours per day, you need to pay from $20 to $48 annually. Even if you always run the air purifier on highest speed, it would cost you only $0.1 each day. If you like to add the Smart Sensor, a great feature to automatically adjust the fan power to suit the current indoor air quality, you need to buy the Alen BreatheSmart 75i. Or if you love both the Smart Sensor and Smart Wifi connectivity function in one air purifier, you should buy either the Honeywell HPA600B or Philips 5000i. As a fantastic high-end air purifier with top-notch performance, the Austin Air HealthMate Plus is your pick eventually, providing that you need an ultimate cure for your allergies and asthma issues. Should I buy Austin Air HealthMate Plus? Yes, this is one of the best air purifiers you can get at the moment, an absolute protection against even the tiniest pollutants. If you have serious allergies or asthma to airborne pollutants: the Austin Air HealthMate Plus is the best machine you can get. If you want a better performance, or better fan power to clean your room faster: you can choose the Airpura V600, as it has a CADR rating of 560 cfm (higher than Austin Air HealthMate Plus, only 400 cfm). If you need a budget version of this air purifier: you can think of the Austin Air HealthMate Plus Jr, which is $220 less. Or if you can afford more, the Rabbit Air MinusA2 has the same quality in air filtration process with $100 less. The original Austin Air HealthMate had better on this list, with $120 less. If you need a more silent air purifier: for the price, the AIRMEGA 400S, Alen BreatheSmart 75i, Philips 5000i and Honeywell HPA600B are more silent than this Austin Air HealthMate Plus. If you care about the annual filter cost and energy cost: the Austin Air HealthMate Plus is the most saving for annual filter cost, but for the power consumption, you should choose the Alen BreatheSmart 75i or AIRMEGA 400S over this air purifier. If you love the additional features: you should look for the AIRMEGA 400S, Honeywell HPA600B and Philips 5000i for both the Smart Sensor and Smart Wifi connectivity functions. Overall, this is the best air purifier I want to buy without any fancy additional feature.